11 July, the International Day against Stoning, will soon be here. As you know Sakineh Mohammadi Ashtiani is still languishing in prison. The authorities recently mentioned her case saying that no final decision had yet been reached on her stoning sentence and that Sakineh must remain in prison. 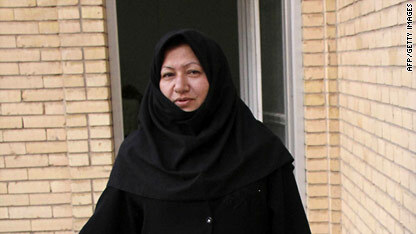 Falsely accused of murdering her husband, her only crime is that she is a woman in Iran. Her lawyer, Sajjad Houtan Kian, also remains in prison for having had the courage to defend her and other women with stoning sentences in Tabriz prison; he has been sentenced to four years imprisonment, been put under a lot of pressure and lost 20 kilos (44 pounds) as a result. The campaign to Save Sakineh Mohammadi Ashtiani has been an important one. It has spoken out in defence of humanity, and against the barbaric punishment of stoning everywhere. It has mobilised immense pressure against and condemnation of the Islamic regime of Iran from millions across the globe. These are accomplishments we must all be proud of. On 11 July 2011, the International Day against Stoning, let’s once again step up the pressure to demand Sakineh’s immediate release and an end to stoning. Join us by either standing in a city square with a photo or poster of Sakineh, tweeting, or by organising an act of solidarity or a flash mob to raise awareness and attention. On 11 July, in 100 cities worldwide, let us once again raise the banner of humanity against one of the barbarisms of our time. We look forward to your action and support. 1. Post your 11 July action and upload photos here on Facebook:http://www.facebook.com/search.php?q=11%20july%202011%20internatoinal%20day%20against%20stoning&init=quick&tas=0.6320757414119951&ref=ts#!/pages/11-July-2011-International-Day-against-Stoning/237122256317387 or email to actionforsakineh@gmail.com with details for posting. You can also tweet on the day (#sakineh #IDAS #11July #iran #humanrights). 3. Write to government officials, heads of state, MEPs and MPs in your country of residence and the UN calling on them to intervene to demand Sakineh and Houtan Kian’s release and to cease recognition of a regime that stones people to death in the 21st century. 4. Donate to the Save Sakineh Mohammadi Ashtiani campaign by making your cheque payable to ‘Count Me In – Iran’ and sending it to BM Box 6754, London WC1N 3XX, UK. You can also pay via Paypal (http://countmein-iran.com/donate.html). We also are looking for volunteers to help with design, graphics, fundraising, and outreach so please contact us if you can help at actionforsakineh@gmail.com.